B: Lukas Vasilikos: What Was He Thinking? Lukas Vasilikos is a photographer based in Athens, Greece. More of his work can be seen here and here. "This photo is taken in a ship, traveling from Athens to Heraklion, Crete. What I first saw was the young woman. The window creates an excellent frame. The beautiful woman staring at the sea could be a photo by itself. But what excites me more in photography is the creation of interesting stories. So I chose to tell a story about these three people, an elderly couple and a young woman. The contrast is between the dreamy environment of the exterior and the realistic, down to earth environment of the interior. 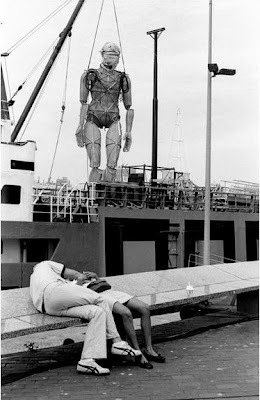 His woman is sleeping but it seems like the man is having an exciting dream. Some details such as the binoculars and the Exit sign give a more dramatic tone to the shot." "This shot is taken at Christmas time, at Heraklion, Crete. I had wandered to the sea wall looking for my next shot. The moment I saw the man with the bicycle and the Santa Claus balloon, I knew that that was going to be my next photo. I just waited for the right moment. I was very lucky that he went and stood exactly where the biggest waves were. 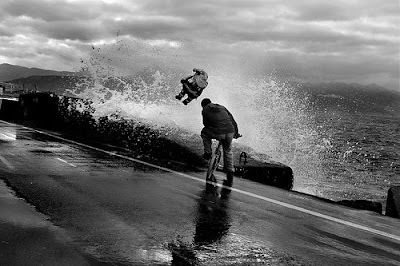 I took the shot a moment before a wave stroked him and made him wringing wet." "A bridge at a Stockholm suburb. The curves attracted my attention. I had the perfect location above but I had to wait for my protagonists to show up. I waited for a long time. Many times you have to be really patient. The little girl made her appearance. She started jumping the curves and the old lady was looking at her, somehow envying her for the game she had just invented. At the last moment and while the girl was jumping the last curve, I saw the old lady joining her in the game and jumping with her. Fortunately it was the moment I pressed the button." "This shot was taken at Syntagma Square, Athens. In the background we see the Greek Parliament. At first glance I saw five different stories in one shot and many interesting contrasts between them. 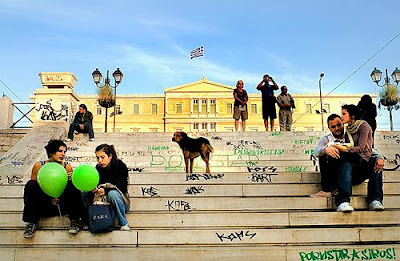 The two girls with the green balloons, the couple at the right, the lonely guy, the tourists and of course the three-legged dog in the center, creating just the right balance. Looking longer, I saw the contrast between the parliament with the Greek flag and the “pornstar” graffiti at the stairs. Life in modern cities can be so crazy and interesting." "Taken at the center of Athens at rush hour. 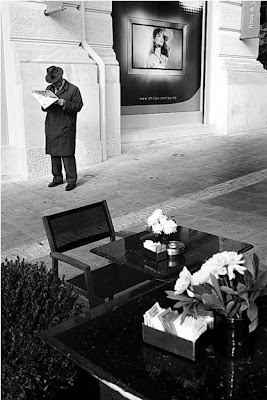 I saw the old man standing there reading the news and behind him the TV showing beauty products ads. I thought it showed a nice contrast between the real world and the imaginary, perfect, and fake world of television and advertisement. I tried to set the old man and the TV apart from the crowd that was walking by which was quite tricky to say the least…"
"Taken at Monastiraki fleamarket, in Athens city center. First, I saw the mirror of a tricycle and I thought it would be interesting to make a photo with its reflection but I had to wait for a long time and take many shots before getting the one that satisfied me. Patience is a key in my photography. The body of the man at the first level that seems to be separating from the head is the central subject. 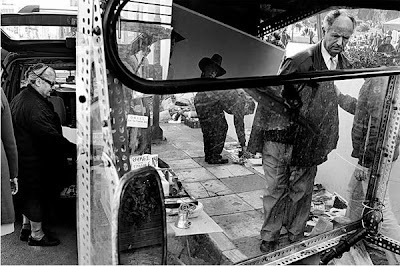 Around this, the couple with the hats, the old lady and the other persons create interesting details of the photo." 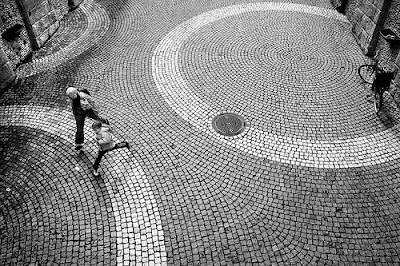 "2008, Stockholm. In one of the many circuses of the city, a religious festival was taking place. 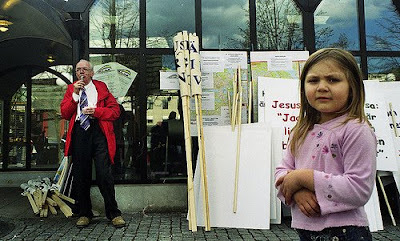 At first I saw the old man eating his ice cream next to the placards with the religious messages, a funny and interesting contrast. Then the little girl came and stared at him, envying his ice cream. I loved her serious face expression and the way she crossed her hands. It seems like the old man is the child and the girl is an elderly." Good body of work, both color and B&W... in fact the whole Seconds 2 Real website is worth a browse. Ok! I know what to say. Achile said it... Lukas of yesterday!!! I spend a lot of time on flickr, but rarely do I find a stream as inspiring as yours. You got skills. Respect! Very nice post. I just stumbled upon your blog and wanted to mention that I've truly enjoyed browsing your blog posts. After all I will be subscribing to your feed and I hope you write again very soon!